TerraSole on Big Shop Lane in Ridgefield isn't new. In fact, it's been there for quite a while. For no particular reason, we just kept overlooking it. Until now. And I am so glad we finally sat down to a meal here. 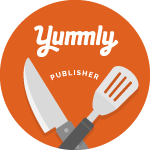 We were invited with fellow food writers to a tasting dinner showcasing a few menu classics as well as a few new seasonal specialties. It was a great excuse to finally see what this eatery was all about. The decor is probably best described as farmhouse chic with exposed wood beams, hardwood floors, and intimate bar area and dining room, with a delightful garden-like patio that seats nearly as many as the main dining room. 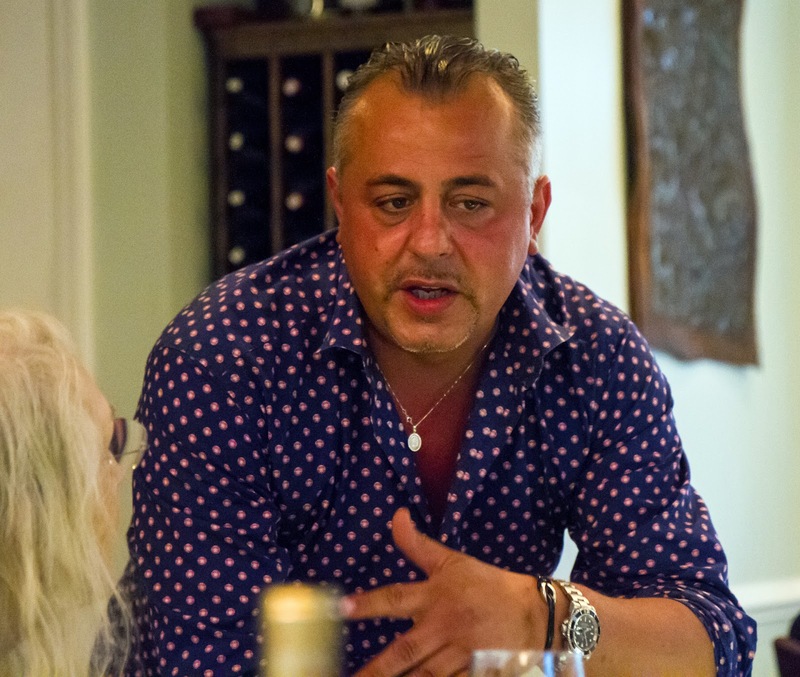 Owner Pietro Polini came to the US in 1999 and worked his way through New York City kitchens before establishing himself in Connecticut. And, prior to opening TerraSole in 2007, Pietro and his wife Lana opened a restaurant in Rimini Italy. The family still owns and operates restaurants in Italy today. As a side note, when Pietro's mom visits from Italy she often holds cooking classes at TerraSole. Pietro and his Executive Chef Gino Jerome work together to create TerraSole's weekly specials and seasonal menus. Whether local or imported, Pietro looks for quality above all else. Interestingly enough there is such limited space, the restaurant has no room from a walk-in fridge or freezer so all produce, meats, fish, cheese and other ingredients are delivered almost daily. TerraSole has an impressive, predominantly Italian wine list with more 200 wines by the bottle and 20 offered by the glass. They also make their own seasonal 'cellos with flavors like the classic limoncello, but also melon-cello and espresso chocolate-cello. For the tasting dinner, we would be sampling various wines, but we thought it would be fun to start out the evening before everyone arrived with a cocktail. We had the Chanel #6 (pictured at the top) with Kettle One, prosecco, Chambord, and pineapple juice. It was crisp and refreshing. 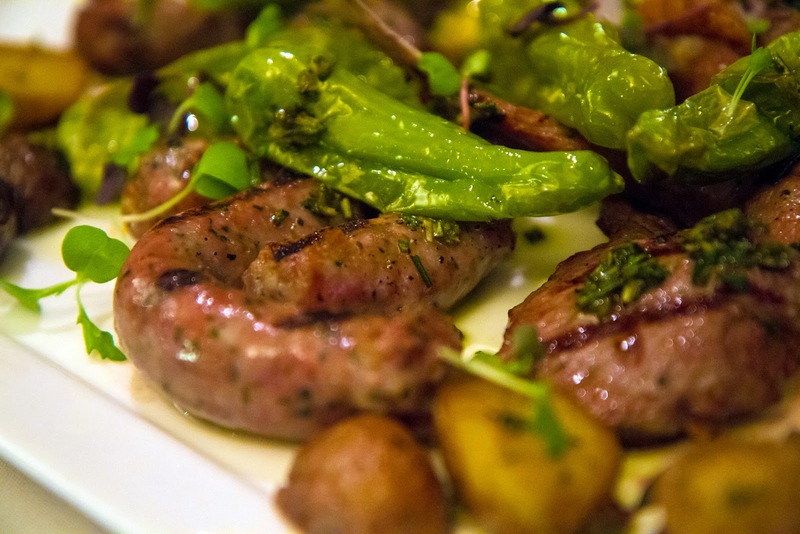 To go with our cocktail, we lightly picked at a platter of meats, cheeses, and housemade focaccia. Once all the guests arrived, we enjoyed a family style tasting of classic menu items as well as seasonal creations. 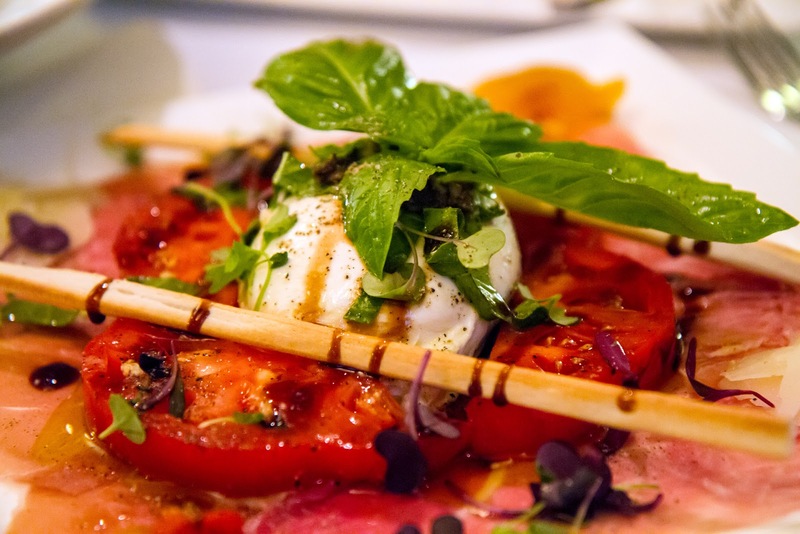 The Burrata Caprese boasts imported black truffle burrata, imported Prosciutto San Danielle aged 26 months, organic tomatoes, roasted peppers, shaved Parmigiano Reggiano, shaved black truffle topped with truffle balsamic drizzle. That's sounds like an awful lot of truffle for one dish, but I was so pleased with my first bite to find that it was not overpowering at all. Our next antipasti dish was unexpected and not particularly Italian, but it was wonderful. 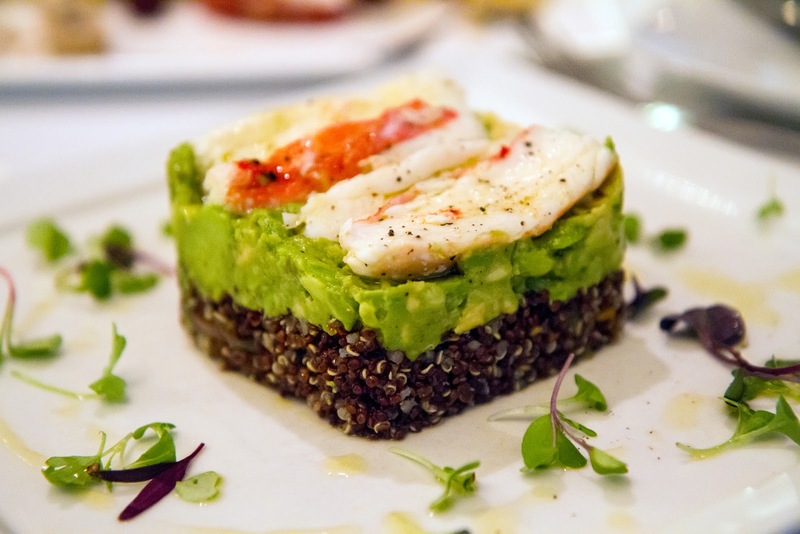 Insalata di Granchio is a salad of Alaskan King Crabmeat over red quinoa, fresh fava beans, avocado and organic multi-colored tomatoes. The quinoa was perfectly al dente. The dish was refreshing and creamy with a "from the sea" saltiness. The last of our antipasti dishes were vegetarian Polpette. Yup, veggie. 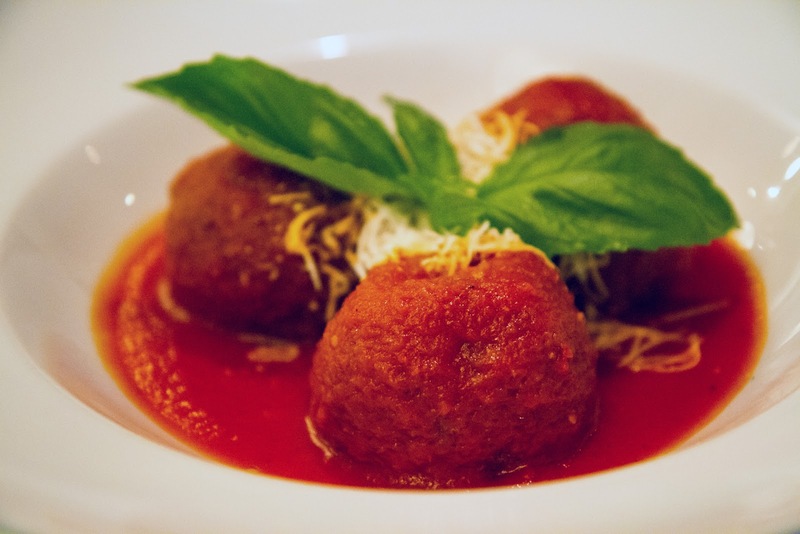 The balls are made with Sicilian eggplant and porcini mushrooms served with San Marzano tomato sauce and shaved Ricotta Salata. This is a delicious option for vegetarians. And yes, I ate them even though they contained dreaded mushrooms. The flavors melded so well together, it's not like I could single out the mushrooms. 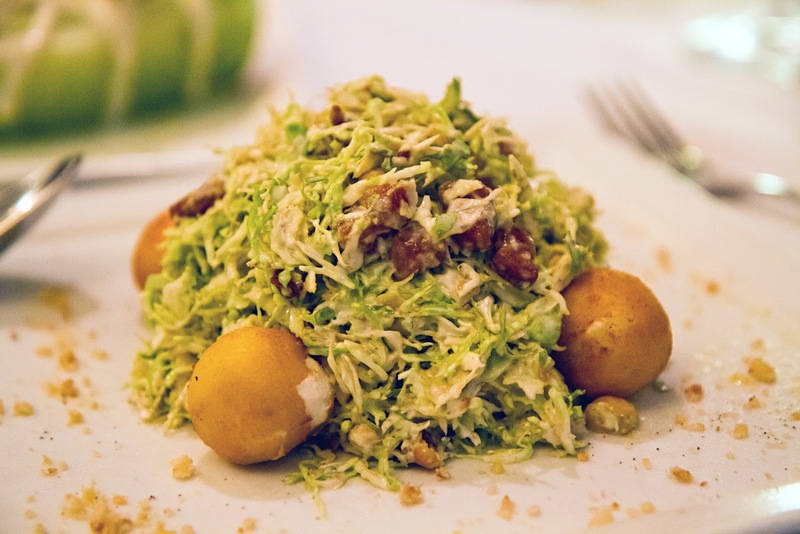 Moving on to the salad course, we first sampled Insalata di Cavoletti with shaved miniature Brussel sprouts tossed with toasted hazelnuts, crispy Pancetta in truffle Parmigiano vinaigrette with Westfield goat cheese croquettes. Here, I found the truffle taste a bit too strong, but I did enjoy the play of textures between the hearty, chewy shaved sprouts, crispy pancetta, and soft goat cheese. Our second salad was a fun take on a Caesar Salad. 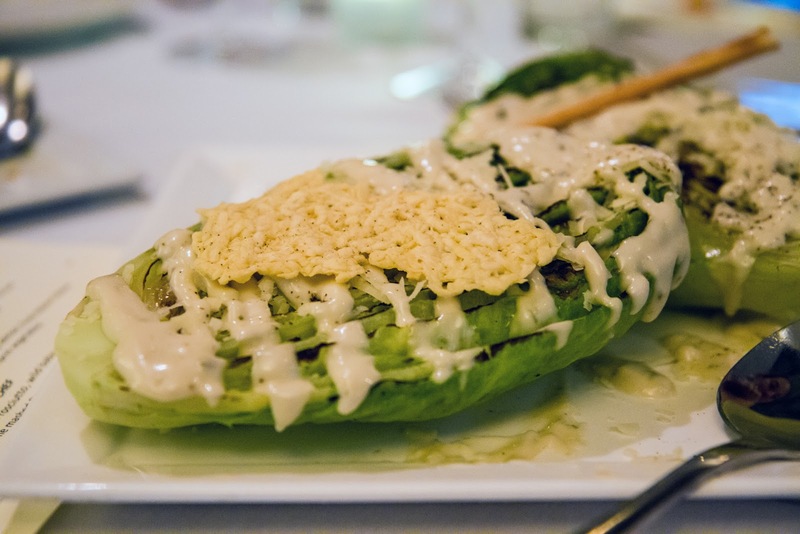 It was a grilled organic baby artisan romaine heart with creamy Parmigiano dressing, Parmigiano crisp, and grissini. I loved the grilled lettuce, it was grilled just enough to impart some caramelized flavor, but still held its freshness. Next up was the pasta course. All the pasta is fresh, except for the bucatini and rigatoni. This was my favorite course. I am after all an Italian girl. I am a darn good pasta eater. Al dente to perfection. 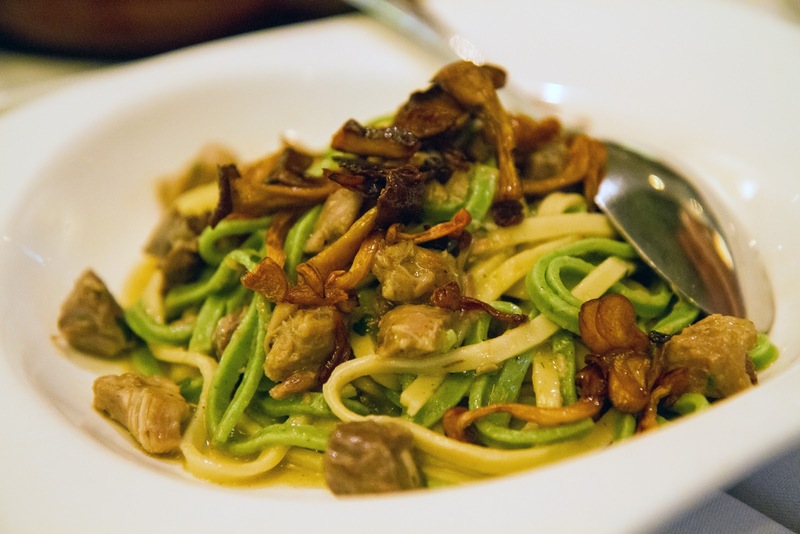 Paglia e Fieno Con Carne Miste e Funghi featured housemade yellow and green fettuccine with mixed braised meats and organic Japanese mini mushrooms. This was way too mushroomy for me. Renato delighted in the earthy flavor. The Cavatelli Con Salsiccia is made with housemade cavatelli infused with broccoli rabe, baked hot and sweet sausage and San Marzano tomato sauce topped with whipped ricotta. There was some nice spice to the sausage and sauce which was tempered as the whipped ricotta envelopes your taste buds. They could have put the family-style serving of this in front of me and I am not ashamed to admit that I would have licked the bowl clean. The third pasta dish, Pasta Di Grano Arso Caprese, was by far the most unique and best one of the night. 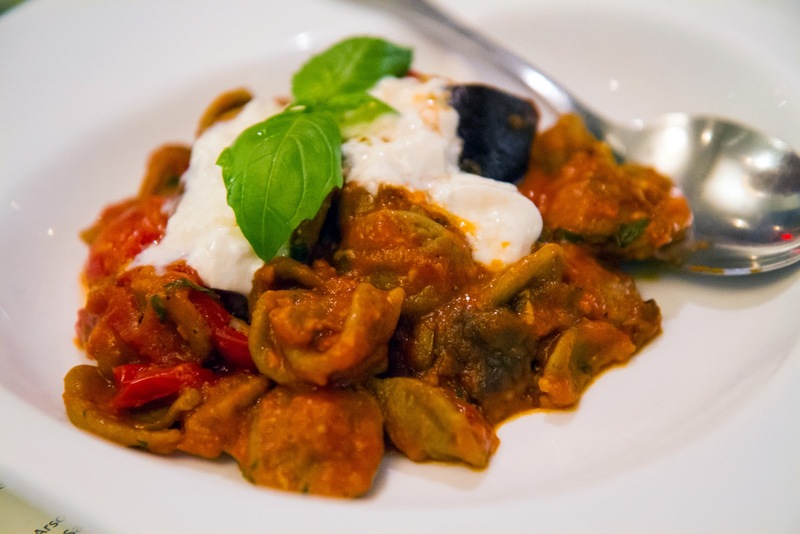 Imported pasta made with burnt semolina grain is tossed with roasted organic eggplant, San Marzano tomatoes, basil, and imported truffle burrata. Each bite was a melody of flavors taking you from sweet to earthy. I highly recommend trying this one. Again, I wanted to eat it all. After the pasta came the main course. We sampled from a platter of grilled meats, Grigliata di Carne, as well as a platter of grilled seafood, Grigliata di Pesce. Both the meat and seafood were not overly seasoned, allowing the freshness and flavor of the meat and fish to shine through. We especially relished in the seafood which consisted of Branzino, prawns, calamari, King salmon and Main lobster topped with lemon and cold pressed extra virgin olive oil. The last main course we tasted was Polletto Dello Chef. This is a playful Italian-take on a Corden Bleu. 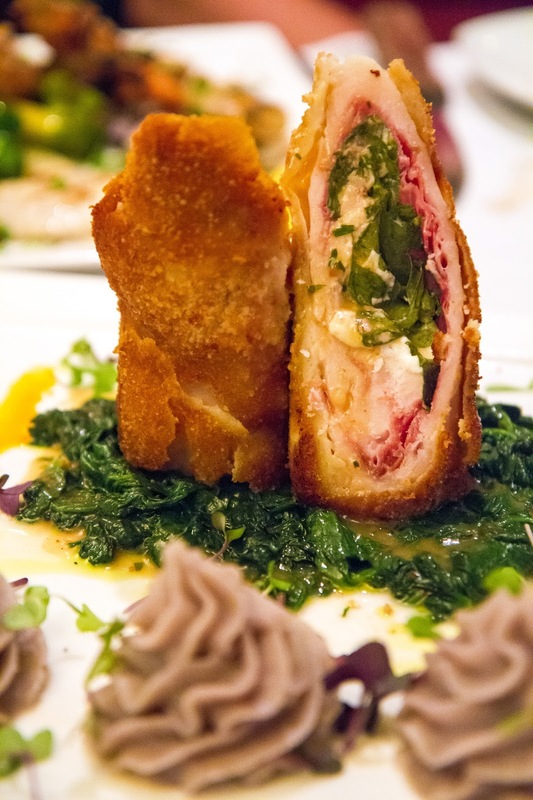 It was Panko crusted organic chicken breast wrapped around Prosciutto, wild baby arugula, and truffle burrata finished with natural chicken broth over truffle mashed Peruvian potatoes and sauteed baby spinach. We wrapped up the meal with a little bit of something sweet. 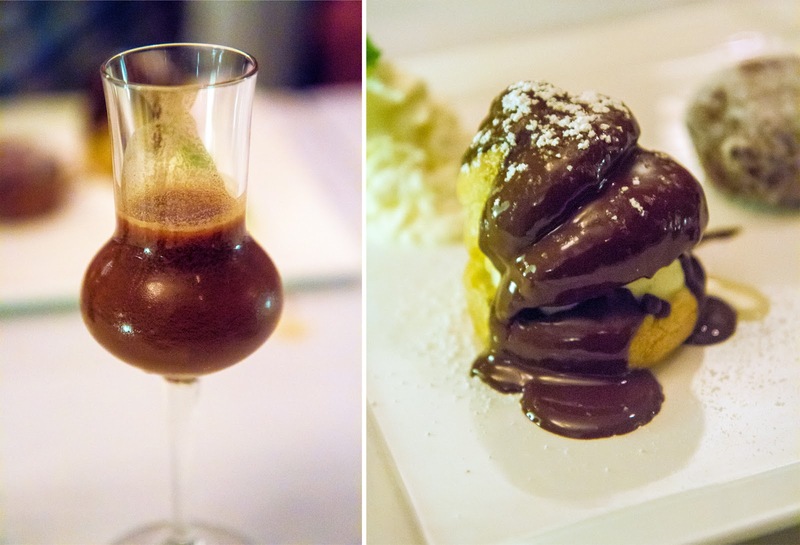 To go with a glass of the chocolate-cello we had a few bites of the Ice Cream Puffs and the Chocolate Banana Beignet. The beignet was gooey sweet deliciousness. 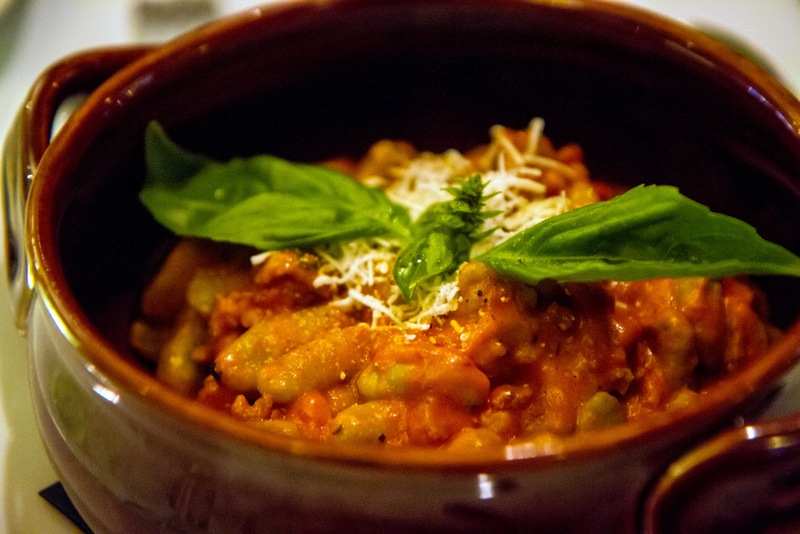 Through the casual yet elegant setting and flavorful menu, TerraSole Ristorante Owner Pietro Polini shares a piece of his Italian roots in this charming Ridgefield restaurant. 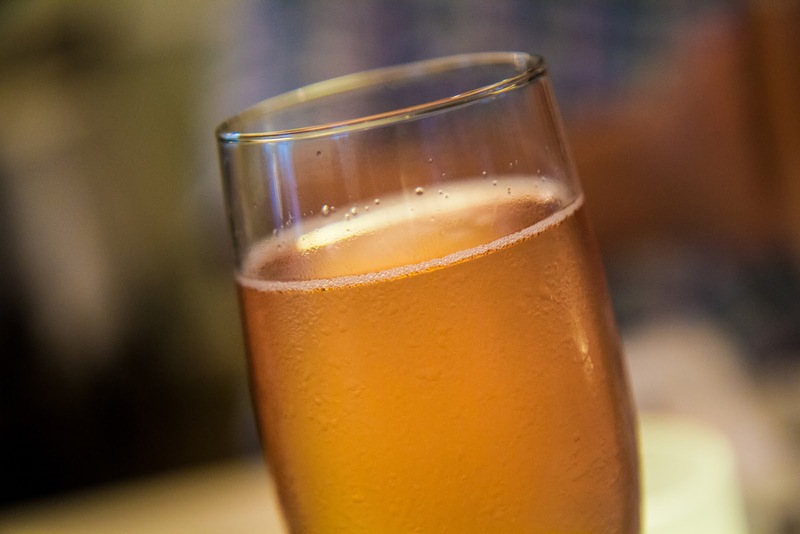 This restaurant is not inexpensive, but it's worth treating yourself for a special occasion. Disclaimer: I was not compensated for this post. The meal was free of charge. The opinions contained herein are my own and reflect my experience. Your own may differ.